You'll find the instructions in the comments section. 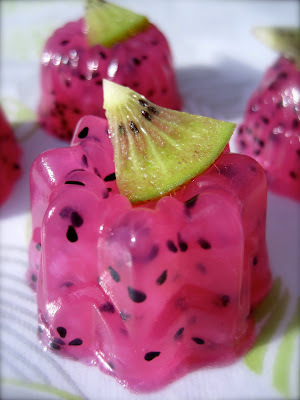 But to make this EXACTLY like we did, you'll need to buy Thai Flowers Flavored Agar dessert mix. There's a dragonfruit flavored vodka out there, too. I can't remember the brand, but it isn't Smirnoff. A friend of mine said it smelled like "the lip gloss you wore in junior high." Yes, Bacardi Dragonberry sounds right. Dragonfruit is extremely similar to kiwi in taste (and texture! ), so I can imagine the rum tasting like kiwi strawberry Snapple. Could anybody please give directions on how to make these including how much of everything to include?! As with most jello shots, the total liquid measurement should be comprised of 1/2 alcohol and 1/2 mixer. I can't find the exact instructions for the Thai agar online, but explanation sake it's probably something like : mix powder with 2 cups boiling water, then refrigerate. Rather than doing that, mix powder with 1 cup (or whatever half is of the package instructions) of dragon fruit pulp (mixer), and bring to a boil. Agar should be fully incorporated, and any granules should be dissolved. Remove heat, and add 1 cup (or whatever half is) of pear vodka. Stir, pour into mold, and set in the fridge for about an hour. 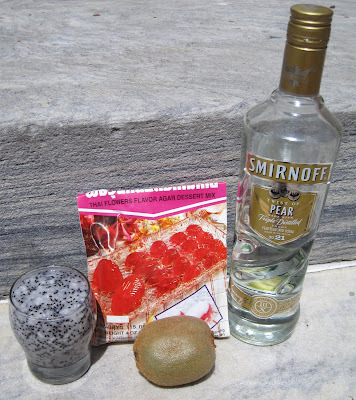 remove from pan and garnish with sliced kiwi. can we get a decent recipe for this, dammit? so frustrating! I have a party tomorrow and I don't have the brainpower to figure it all out. stop torturing us! Yo, 'Nonymous, You have to get the flavored powder mix if you want to make this EXACTLY like we did! My loose instructions are in the comment above yours! REALLY though, you could use unflavored gelatin and food dye, or like, raspberry jello and just ad the dragonfruit pulp and the booze! Love your site! So creative! 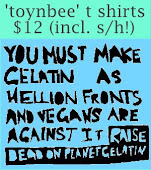 have you been to jellinator.com yet? I've never made jello shots do you have instructions listed anywhere on your blog? drkaytrotter, There is a general explanation of how we make Jello in the tab, 'This is how we do it' Try to not get Montell Jordan stuck in your head. I can't. WOW! love all your fabulous ideas. Can't wait to try some of these delish looking little works of art! This is happening for my birthday, cinco de mayo. Yum! 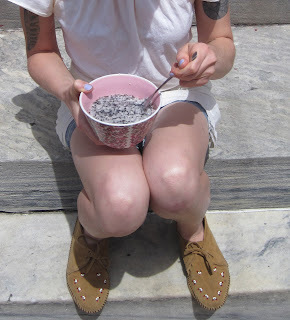 Where do you find the powder mix and the dragon fruit pulp?? The powdered mix is from an asian grocery store here in philly (the one in Wing Phat Plaza on 11th and Washington) and the dragon fruit was purchased whole from Spring Garden Market, which is also an asian grocery store here in philly. 1. Mix contents of this packet with2 cups (480 ml) water. 2. Boil until completely dissolved, stir occasionally. 3. Pour into molds, add diced fruits such as pineapple, papaya and jackfruit to make "fruits-Stuffed Agar" when agar begin to set in. Sugar, Agar-Agar, Artifical Flavors and Colorings. Unlike gelatin (Jell-o) agar-agar sets at room temperature and is vegetarian. how many shots does this make? and how many dragon fruits do i need? did anyone figure out this recipe? if so, could you please type it out for me?